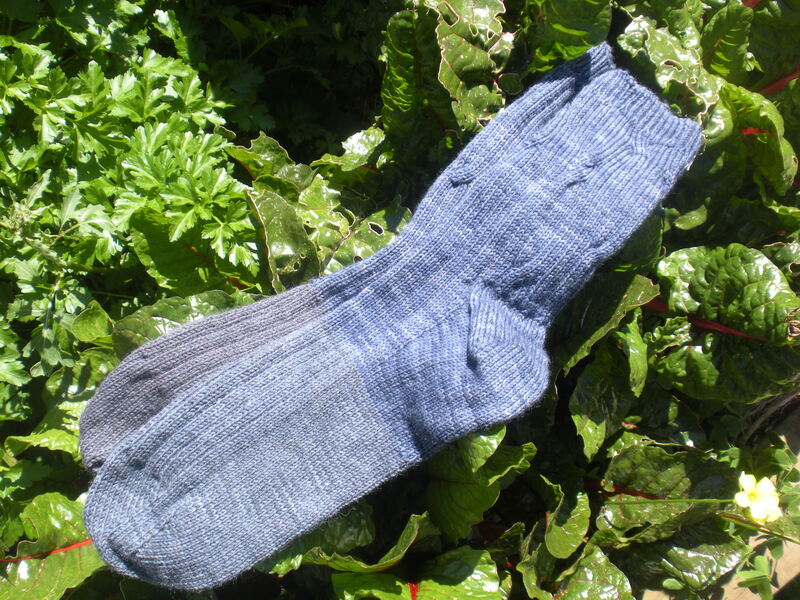 I have finally finished a few pairs of socks that I’ve been carrying around for weeks… these were dyed with black beans (the blue yarn) and purple carrots (the greyer yarn). I gave them random cables and I like the effect. Happily, so does the recipient! Today I went round to visit my all time favourite neighbourhood dye plant. I lived in the street this tree grows in for years, and I adopted the tree under a council programme–not that this made me any more fond of it than I already was. I have had rust through to burgundy colours on wool from the leaves and bark of this tree. Over the last year or two I have propagated native plants to grown under it (saltbush, mostly), planted them and mulched the tree to keep the weeds down. My Dad even got in on this, offering me seedlings and cuttings from his garden and collecting saltbush seed for me. 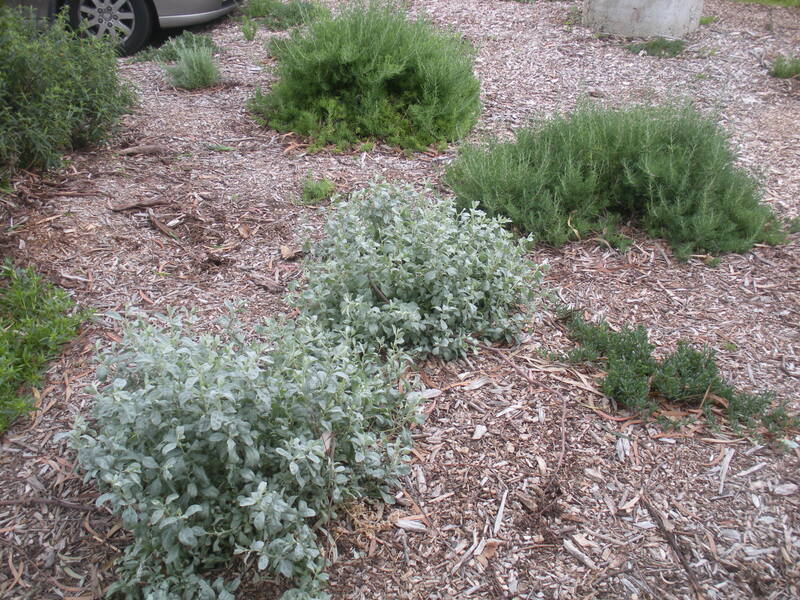 I was surprised to discover that saltbush was so easy to propagate from seed when the weather was warm. Dad seemed to take it for granted I would be able to do this! I have about 50 more little plants that have stayed tiny all winter but will soon spring into growth ready to be planted around my suburb. 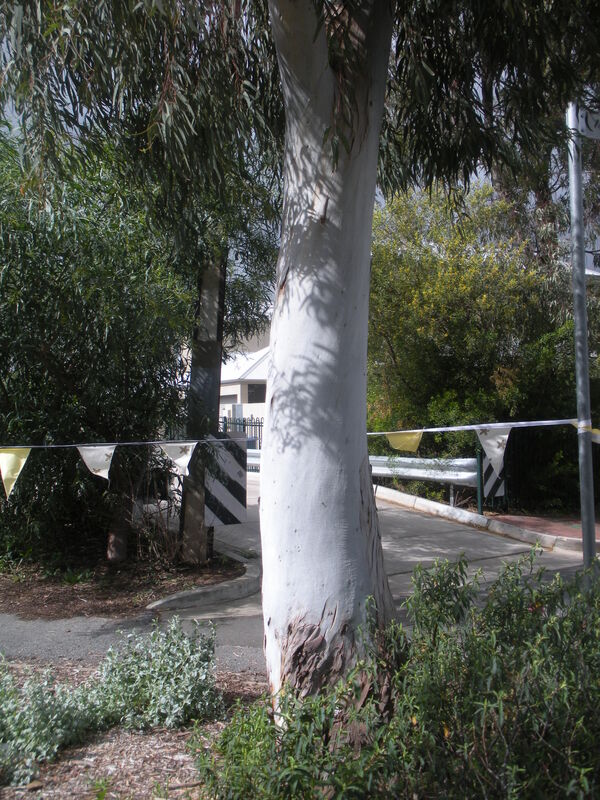 I’ve been weeding around this tree for years in an effort to stop the council spraying poison into the neighbourhood. I’ve been collecting rubbish from round the neighbourhood, and especially this tree, too. I like this tree a lot. Piping shrikes nested in it several years running. Kookaburras sometimes sit in it and laugh. Little birds come through it often, and white ants have unfortunately made homes here too. Someone has put a bird box in it in the last year, but I haven’t seen an occupant yet. Anyways, today I weeded, cleared rubbish and then applied bunting. The Royal Show starts in a day or two and people will park in the streets all round this tree and walk through the patch we have been busy revegetating to get to their cars after dark. In the past, I have occasionally been dispirited to have quite a few of my little saltbushes pulled out by the roots or casually squashed as people pass through and plant guards thrown away. I thought bunting might at least cut down on accidental damage. Over the time I’ve been working on growing things under this tree (and collecting bark and leaves!) people passing by have gone from quizzical to interested to pulling over in their cars or stopping with their dogs to thank me. I think as the plants grow larger it is more obvious what I am doing and how lovely this otherwise weedy patch could be. My friends have come along on mulch applying and watering missions, too. It’s a blustery day, so I hope the bunting will make it! The show runs over two weeks. Here’s hoping most of the smaller plants make it to the end. 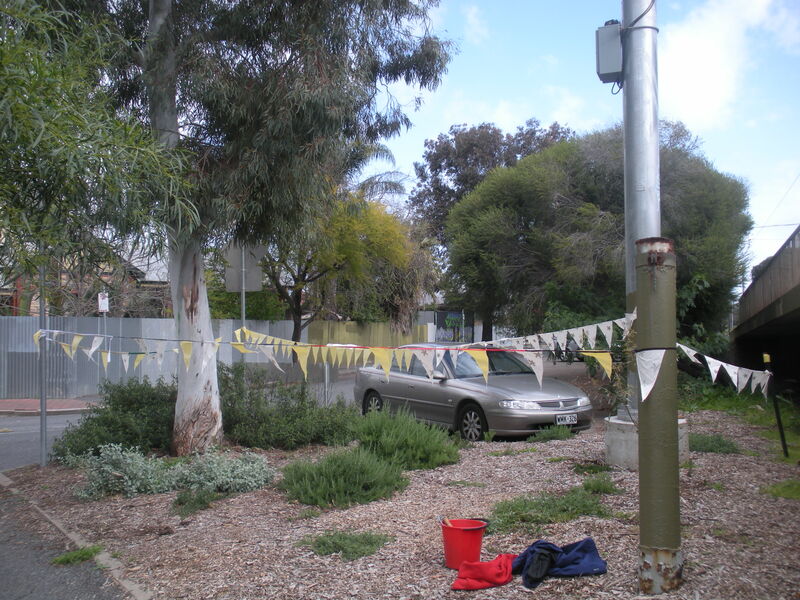 A cyclist came past while I was working, nodded and told me he thought the bunting was a good idea. At least until the show is over, I’m thinking. looking good. Let’s hope it survives the trials of the weary show-goers searching for their cars after dark!